Governor KK Paul releases a book titled “Shanti Ki Talaash Mein Zindagi” authored by Dr Radhika Nagrath in Dehradun on Wednesday. Governor KK Paul today released a book titled “Shanti Ki Talash Mein Zindagi”, written by Haridwar-based author and journalist Dr Radhika Nagrath, at a function at the Raj Bhavan auditorium here today. The Governor said the book is a philosophical treatise written in a simple language with interesting examples and anecdotes from day-to-day life. He congratulated the author and said the book was a result of an indepth study of life and people and highlighted the importance of avoiding superficial things that make life hollow. He said the book is also an attempt to tackle the philosophical challenges before man and stimulated the minds to think about the reality of life. The 5,000-year-old Indian civilisation had always advocated a value-based way of living and regarded superficiality as “mrigtrishna”. The Governor said through meditation one could win himself and everything else. 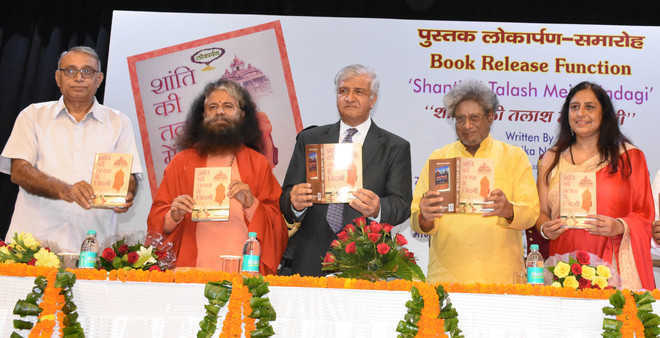 The book release was being aptly done on the occasion of Hindi Divas. Swami Chidananda Muni of Parmarth Niketan, who was a special guest on the occasion, said people all over the world were looking for peace but life goes away in “setting” things. “Wants are limitless and running after desires cannot give peace. Meditation and introspection are important in life and are like anchors,” he added. Dr Pranav Pandya, head of the Gayatri Parivar, who was also a special guest, said peace was within us while we keep looking for it outside. “If a person attains peace, he or she will get joy and success,” he added. Shambhunath Shukla, veteran journalist, said, “Peace is everyone’s goal and people should try to be happy instead of always expressing unhappiness”. Earlier, Dr Radhika Nagrath spoke about her book and said she had written about some time-tested solutions that could help the readers find inner peace. She had interviewed many life-coaches to arrive at some conclusions regarding peace. She derived inspiration from a conference on sustainable peace held in the University of California, Los Angeles, in 2009 where delegates from the United Nations had come and every one presented an idea on peace which forms part of the book. Former Chief Minister and MP Ramesh Pokhriyal Nishank was present on the occasion.